Martin Luther’s Home The Luther family, wife and six children, and various students and visitors lived in the central part of the building. He was given the building by one of the aristocrats supporting his movement. The Luther household was often quite extensive—a real test for Katie’s ingenuity at balancing the family budget!—because of relatives, students, and associates who were domiciled there or regularly present at Luther’s elbow for one reason or another… Luther had been a member of this monastic order since 1506 when he completed a one-year probationary novitiate, and in a sense he really felt he had not left it until June 13, 1525when he married Katharine von Bora, who had been a nun. 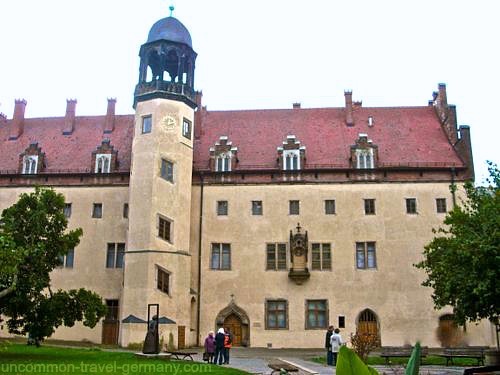 Luther had lived in the old monastery ever since joining the faculty at Wittenberg in 1511. Here he had his living quarters, often preached for the Augustinian chapter, and eventually also delivered his lectures as professor of Biblical theology at the university. Elector Frederick the Wise had designated the old monastery to be the family home for Luther and Katie, as Martin affectionately called his bride. She was up to the challenge, and with him established a model parsonage family and home. Together they rejoiced over a circle of six children that gladdened their hearts, but then also saddened them when Elizabeth died as an infant and Magdalene as a vivacious teenager. Katharina von Bora was by no means a modern or a post-modern woman. She is the antithesis of the so-called ‘liberated’ feminist. She did not seek to “find herself”. She did not “shop till she dropped”. She could not have fathomed having an abortion. She was not “self-fulfilled” and yet she could run a household the size of a small business. She was not looking to smash “glass ceilings”. Women today seek in this zeitgeist (“spirit of an age”) is also what men look for in our so-called ‘enlightened’ age and it is certainly not what our Lord says: deny yourself and take up your cross and follow Me. Frau Luther was no nun. You can not find a word about nuns in the Bible but much about wives and mothers who were heroes of the faith in Old and New Testaments: Sarah, Rebekah, Rachel…Mary. She was not ‘holy’ by her self-chosen ‘spirituality’ and holy deeds but made holy by her faith in Jesus Christ lived in her domestic vocation. Once again we are told that the Pope will make a saint, this time Mother Teresa. No pope, no man nor woman makes a saint, Jesus Christ does in baptism and faith according to His Work of Redemption for Katharina, Teresa, you and I. Katharina was the antithesis in some ways of a Mother Teresa. Katharina is the model of woman that pertains to all of humankind and those of the household of faith: fathers and mothers and their children and the 4th and 6th Commandments. We need to look more at a saint like Katharina than a Teresa. The crescendo of Proverbs is the last chapter, 38 and it is all about wives and mothers. Here is a saintly portrait of a Mother, like Katharina. I think Frau Luther epitomized this last chapter of the book of Proverbs. God be praised for all faithful wives and mothers who confess Jesus Christ!